Designed by Gucci's Creative Director Frida Giannini, the I-Gucci is Gucci Timepieces’ first digital watch and has become one of its best-selling models. The I-Gucci Sport was introduced in 2011 to celebrate Gucci Timepieces’ partnership with The Latin Recording Academy®, hosts of the Latin GRAMMY® Awards. Since that time, the I-Gucci Sport has also been released in a limited edition, the I-Gucci Sport GRAMMY® Museum model. 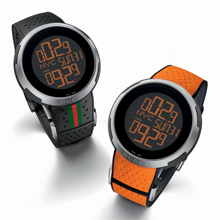 Gucci Timepieces is now pleased to introduce new extensions to the I-Gucci Sport collection, recognizable by a striking perforated rubber strap in three appealing color schemes of black, orange and cobalt blue. The black variant features extra detailing seen in a slim but striking section of the iconic Gucci green-red-green web stripe embedded in the rubber strap. As with all I-Gucci models, the watch has been created in a larger size of 49mm and features a brushed steel and rubber case with four push-buttons. The bold and robust digital display can be set to show two time-zones, and is available with a black dial and orange digits (black and orange variants) or with a silver dial and blue digits (blue version). The dial can also be switched into analogue mode (showing hands). 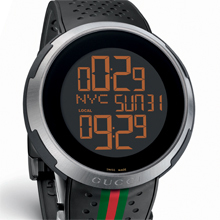 Functions on the dial include a backlight, alarm and date; the ‘Swiss Made’ stamp appears at 6 o’clock and the ‘Gucci’ logo can be seen at the foot of the bezel. The I-Gucci Sport boasts a range of technical components including a chronograph and dual chronograph, countdown timer, tachymeter, pedometer and a sailing function specifically designed for timing regattas. 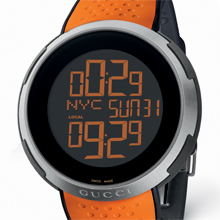 For the I-Gucci Sport Gucci Timepieces has used new combinations of materials, seen in the thick rubber bracelet, composed of black, orange or blue perforated rubber, laid over a black rubber strap. This soft yet sturdy material, with perforated holes reminiscent of sports car interiors, lends the timepiece its sporty allure.